What's with all the Chromebooks? In a world full of largely similar Chromebooks, HP's 14-inch (and aptly named) HP Chromebook 14 stands out largely because of its comparatively big screen; all other Chromebooks rock roughly netbook-sized screens. Now that Haswell and multiple color choices are coming to HP's Google-powered laptops, it appears the company is gearing up to release a more compact Chromebook. 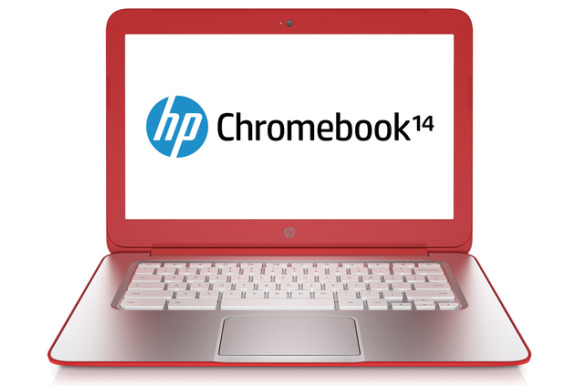 As first spotted by Engadget, numerous references to an "HP Chromebook 11" have popped up on the PC maker's website. The first clue appeared on HP's listing of EnergyStar-compliant computers, though that particular PDF was scrubbed clean of any Chromebook 11 references overnight. Engadget also found a (largely blank) drivers, software, and firmware page for the Chromebook 11, and that's still standing strong. After news of the Chromebook 11 leaks broke, a tipster sent Engadget a purported unpublished Best Buy listing for the laptop, complete with alleged specs. The screenshot claims the HP Chromebook 11's 0.7-inch frame weighs in at 2.42 lbs., with an 11.6-inch screen, 6.5 hours of battery life, 100GB of free Google Drive storage for 2 years (gulp! ), and Beats Audio support. We'll have to wait and see if those specs prove true, but one thing's for certain: In a world of willowing PC sales, the Microsoft-made Surface tablets, and lackluster Windows 8 love, the Chromebook star is ascending. Not only are PC makers churning out Chromebooks in ever-increasing numbers—Asus and Toshiba just announced they're hopping on the bandwagon, too—but Google has been toiling away at increasing the offline functionality of its cloud-focused operating system. The tandem seems to be working, slowly but surely: The NPD research group claims that Chromebooks now account for a quarter of all sub-$300 laptop sales, and Google's laptops were one of the almost frighteningly few bright spots during an otherwise bleak back-to-school shopping season. Senior editor Brad Chacos covers gaming and graphics for PCWorld, and runs the morning news desk for PCWorld, Macworld, Greenbot, and TechHive. He tweets too.